Today we woke up, grabbed a bite for breakfast, Rebecca Skyped a bit, and we were out the door. We had a Korean cooking class scheduled near Insadong at O’ngo. What was crazy about this place is that, before I moved to Korea I found this company and had plans to take it while living here. I never got around to it and the brochure still hangs on my refrigerator to this very day. Rebecca was coming up with her itinerary before her visit and found it while notating things to do and places to see. Rebecca, the worldly traveler she is, took a cooking class in Thailand while on a trip and loved it. So once she found this class she immediately emailed the company for more info, in the meantime asked me what I thought. This is a true story! How in sync are we?! There was no thinking about my response. Yes! Yes, what an outstanding plan! O’ngo offers many different classes and tours. We decided on a bulgogi and cucumber kimchi course. 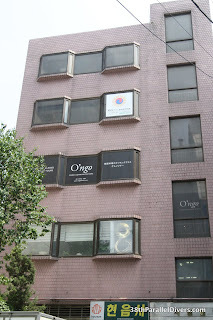 We took line one to Anguk station and wondered a bit more around Insadong. In search of cool postcards and food magnets. Ha Ha! Don’t ask…it’s a crazy touristy Korean thing. We dawdled a bit, grabbed some postcards and realized quickly we were getting much closer in time to our class reservations. Sorry O’ngo! We were 7 minutes late…eek! We found the O’ngo building location and rushed up to the third floor. The ladies that greeted us were absolutely fabulous! They immediately offered us tea, coffee, or water. They didn’t mind a bit that we were running behind on time. We were taken into an connecting room that had a culinary setup. One station was set up for our instructor, the other for Rebecca and myself. We were the only two in the class. Talk about one on one attention! The private atmosphere was awesome! This gave us ample opportunity to take our time and ask any pressing questions that we had. We started off with watching our instructor prepare cucumber kimchi. I’ve got to tell you folks, I’m so excited to recreate this! Yikes! Look out Rebecca... that's got some spice to it. After watching the cucumber kimchi instructions we were to head back to our station and recreate what we just learned. Rebecca was much more handy with the knife. Although I loved that she was able to show me a few new tricks of the trade. I’m thinking a knife course is in my near future. After preparing the cucumbers we went back to the instructors station and watched her prepare the bulgogi marinade. The aroma was incredibly delicious! We loved how the bulgogi marinade ingredients were so simple! Asian pear, garlic, onion, mushroom, soy, sugar, sesame oil, sesame seeds, pepper to taste. We were also delighted to learn that pineapple or kiwi in the place of the Asian pear too. YUM! Cooking up our meat. Perfect again! It's like she is a pro or something.. .ha ha! Final products. YUM! We got to taste too! Rebecca and I agreed that we need to continue on with this tradition and when we meet up again in the future. It’s so much fun, you learn something new, and you get to enjoy the fruits of your labor with others! Besides the farmers tan we are looking fab in the kitchen! After cooking, we plated our meals and sat down to enjoy. Check out our hard work. After finishing the meal we didn’t know we were in for a special treat. We had a market tour! What fun! Again, I learned more about the Korean foods and culture. The Guide was very sweet and very patient with us. I loved that Rebecca had the opportunity to chat with an English speaking Korean. The owner will grind the red pepper for you too. We parted ways with our guide and set out for Lotte Hotel. We started out earlier in the week trying to book a tour to the DMZ but disappointingly due to location and subway times were not able to. Rebecca continued to do some reading in her Seoul City guidebook and was able to find two more companies offering the tour as well. Score! We arrived at the Lotte Hotel and were instantly blown away at the classiness of the hotel. We made our way to 6th floor. The elevator doors opened and there were travel agencies upon travel agencies. We located the one we needed and were also able to book a tour for Friday! Score! What a relief! I feel much better now, this was something I knew when she visited she should experience if she could. After booking the tour we made our way back to the subway and went home. What an incredible day! I can’t stop smiling when I think of how much fun I had this week, today, and knowing I still have more time and a few days left to share with Rebecca.